It is in print and on the kindle. It is called Atmospheres. It’s 242 pages. It’s hard to describe. About a year ago, I started writing this experiment, which was a collection of almost ambient scenes, brief snippets of no story, just outbursts of emotion or scene. I wanted to eventually link them together in some way, but it became more important to simply generate the pieces each day. 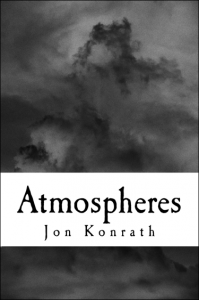 When I worked on finishing Thunderbird and doing all of the steps of publishing it, I needed to continue writing something, and that’s where the beginning of Atmospheres started. I’ve always had a minor obsession with Jim Jarmusch, and I often listen to the soundtrack to Broken Flowers when I’m writing. One of the songs on there is an edited clip of the Sleep song “Dopesmoker.” I’d been vaguely familiar with them from a million years ago when I used to write about death metal, but wasn’t fully aware of that particular album. I’d read an interview with Jarmusch where he talked about being preoccupied with that album, so I got a copy, and then I became locked into it. If you haven’t heard it, the album is one song, a 63-minute stoner metal song that’s essentially one heavy riff played over and over, talking about a caravan of weed-priests crossing the desert to Jerusalem with their magical hashish. The lyrics are corny, but the song itself is an hour of pure hypnotic sludge, and puts you in a trance mode. And while I did not imbibe in the titular substance discussed in the song, I made it part of my process. I’d sit down every day, put the song on repeat, and completely lose myself in it, writing about whatever escaped from my subconscious thought onto the page. Within a few months, this brought out an incredible pile of 500 word chunks, some perfect stories, some absolute junk. But it amazingly brought out some common threads through the manuscript when I pushed them all together. There’s a scene in the Naked Lunch movie where Ginsberg and Kerouac (or facsimiles thereof) go to Interzone to visit Bill, and find an apartment filled with scattered random notes (and heroin), and that’s what the book read like before I started editing. This is by far the most challenging read of any of my books. It has a story arc in three acts, but it doesn’t have a conventional plot, which will throw a lot of people. But it contains a lot of brutally honest writing that cuts deep, and it was a lot of fun to write. If I had to compare it to anything I’ve done, it’s a lot like Rumored to Exist in ways, but I think the pieces are darker with a lot more thickness to them. This is my tenth book, which is a strange milestone to reach. And every time I finish one of these, I fall into a deep depression and a brief panic, first as I wade through all of the production steps of releasing one of these things, and then as I try to start the next project. And I have no idea how to sell this book or what’s next, so I’m not prepared for this. But, I need to keep working, so I will. Anyway, check out the book, and let me know what you think. If you have any wise ideas on helping me to get the word out, or if you’d be kind enough to forward on this post, that would be awesome too. Thanks for everyone who helped me to get this thing done, especially John Sheppard, who did a ton of editing and reading for me along the way. This entry was posted in Uncategorized and tagged atmospheres, books, Sleep by jkonrath. Bookmark the permalink.